The Best Women Wrestling blogs from thousands of top Women Wrestling blogs in our index using search and social metrics. Data will be refreshed once a week. Worldwide About Blog Diva Dirt is the online resource for female wrestling,news, editorial and interviews since 2008. Facebook fans 18,002. Twitter followers 118,781.
worldwide About Blog The number one source for women's wrestling news, results, interviews, and more. Facebook fans 886. Twitter followers 4,470. San Francisco, CA About Blog This is a subreddit devoted to appreciating women's wrestling. Also find all the latest discussion related to women's wrestling on this site. Facebook fans 1,187,959. Twitter followers 545,936. About Blog A blog about WWE Women Wrestlers, Female Pro Wrestlers and British Female Wrestlers from the past, present and future. Germany About Blog WomensDivison HD is your #1 Channel for everything WWE women's related. Facebook fans 1,149. Twitter followers n/a. About Blog Simon Fraser University Wrestling is an NCAA Division 2 athletics program, located in Burnaby, BC. Follow this site to receive all of your updates on Wrestling. Facebook fans 993. Twitter followers 637. Plainview, TX About Blog Latest news items from Wayland Baptist University for Women's Wrestling. Facebook fans 2,832. Twitter followers 2,378. Lebanon, Illinois About Blog The official website for the McKendree University Bearcats athletics. Find articles on women wrestling on this site. Facebook fans 6,112. Twitter followers 4,685.
https://twitter.com/MenloAthletics About Blog Find latest updates on menlo college's women wrestling team on this site. Facebook fans 2,059. Twitter followers 1,104. Oklahoma City About Blog Oklahoma City University competes intercollegiately in men’s and women’s wrestling. Find latest news related to women's wrestling on this site. Facebook fans 3,641. Twitter followers 3,005. Batesville, AR About Blog Official Site of the Lyon College Scots women wrestling team. Facebook fans 1,128. Twitter followers 27. About Blog News from the Jamestown website related to women's wrestling. Ottawa, Kansas About Blog News from the OU website related to women wrestling. Facebook fans 2,584. Twitter followers 3,020. Forest City About Blog News from the Waldorf website for women's wrestling. Facebook fans 1,749. Twitter followers 1,492. Bristol, TN About Blog In 2009, King established a Women's Wrestling Program, and joined the WCWA .Find Women's Wrestling News on this site. Facebook fans 2,641. Twitter followers 737. About Blog Katherine Shai is the author of LuchaFIT. We're here to provide educational insight and empowerment for female wrestlers. Follow to learn about how to optimize yourself physically and mentally! Facebook fans 695. Twitter followers 156. About Blog On This Channel Find Full PPV matches and latest updates related to women wrestling. 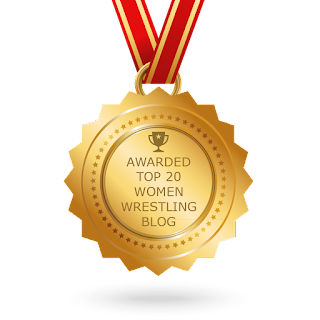 CONGRATULATIONS to every blogger that has made this Top Women Wrestling Blogs list! This is the most comprehensive list of best Women Wrestling blogs on the internet and I’m honoured to have you as part of this! I personally give you a high-five and want to thank you for your contribution to this world.